The Run Above the Clouds 2018 Scholarship Deadline is June 25. See below for application. 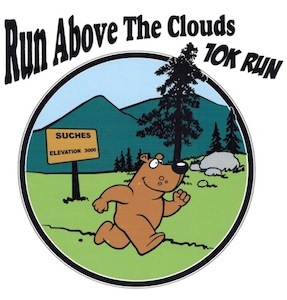 The Run Above the Clouds offers 10K and 5K road races over a beautifully scenic, challenging out-and-back course through the North Georgia mountains. There is also a 1-mile Fun Run & Dog Jog, over a mostly flat course. Race day is Saturday, Oct. 5, 2019. The Run Above the Clouds is a benefit for the students of Woody Gap School, the smallest and only K-12 public school in Georgia. Every year The Run Above the Clouds awards scholarships to graduating seniors and to postgraduates of Woody Gap School to encourage them to continue their education. We are a 501(c)(3) nonprofit organization. We thank all of our sponsors and runners for their continued support! As of 2018 both our 5K and 10K routes are USATF certified as well as qualifiers for the AJC Peachtree Road Race. We, also, use the MyLaps timing system. Entry fees are $30 for the 10K and 5K if your application is postmarked by Sept. 11, and $35 Sept.12-Oct. 3, then, $40 at registration Oct.4-5, The 1-mile Fun Run & Dog Jog is $25 until Sept. 11 and $30 thereafter. We encourage everyone to print the ﻿entry form﻿ and mail it in advance or register on Active.com till Oct. 2. T-shirts and awards: Race day you are guaranteed a high-quality T-shirt (your choice of short- or long-sleeved if you run 10K or 5K and short sleeve if you run in the Fun Run) if your application is postmarked by Sept. 11. Those who register after Sept. 11 can order a shirt on race day and have it mailed to them. Age groups are 14 and under, 15-19, 20-29, 30-39, 40-49, 50-59, 60-69, and 70+. Awards are two deep for male and female in each group and the top overall for the 10K and 5K. You can register on Active.com. till Oct. 2. At 2800 feet, The Run Above the Clouds is Georgia’s highest (and perhaps most scenic) 10K, featuring “The Cooper Gap Climb,” a 230-foot elevation change over a one-mile stretch. The Start/Finish for all three runs is in the parking lot across from the Suches Community Center on Hwy. 60 in Suches, Georgia (15 miles north of Dahlonega in the beautiful Suches Valley). The Fun Run & Dog Jog turns around after 1/2 mile. The 5K & 10K go by Woody Lake on Highway 60, then turn onto Cooper Gap Road.. 2 1/2 K after the start, the 5K turns around. The turnaround for the 10K (after 5 K) is in the small community of Mt. Airy. All three turnarounds will be clearly marked. Registration/Packet Pick-up will be held at the Suches Community Center the night before (Oct. 4) from 6-8 PM and race day (Oct. 5) from 7-8 AM. Prerace Meeting will be at the start/finish line across from the Suches Community Center at 8:15 AM. Start time is 8:30 AM for the 10K & 5K with the Fun Run & Dog Jog following. Baby strollers as well as vaccinated, well-behaved leashed dogs are welcome to run in the Fun Run & Dog Jog. Water stations are provided at three points on the 10K course. The race is the kickoff event for the Indian Summer Festival, which is held on the first full weekend in October. Stay after the race to enjoy food, live entertainment, and plenty of vendors with local mountain arts and crafts. Where else can you run a race, get a T-shirt, and take in a great local festival, all in the same morning?